I work with a wide range of subjects in many different medias. 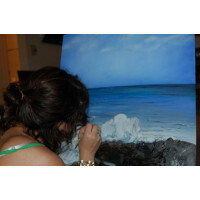 Sometimes I love to make landscapes, sometimes I get more into the abstract side. I have been in Charleston for about six years and love living here, and incorporate much of what I see around me in my artwork. 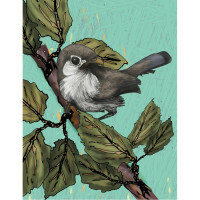 "Yellow Marsh" by Mary Pepin, Mt. Pleasant, SC. 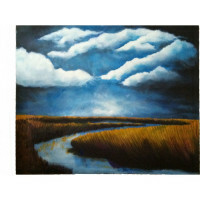 An oil painting of the view of the marshes be..
"Day Dreaming Red" by Mary Pepin, Mt. Pleasant, SC. 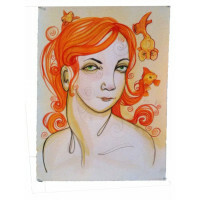 Watercolor painting of a red haired girl ..
"Bird1" by Mary Peping, Mt. Pleasant, SC. 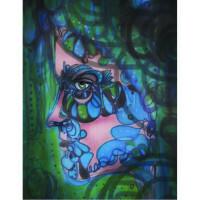 Hand drawn work, editited and colored on the comput..
"Blue Girl 1" by Mary Pepin, Mt. Pleasant, SC. Hand drawn and colored, then edited on the com..